And it's worth a pretty penny. You never know what you can find a thrift store, that’s what makes them so treasured. Whether it’s a set of silverware you’ve been looking for or a great looking shirt with the tags still on selling for just dollars, there is nothing better than a great thrift store find. You could even find a newspaper. And this was no different at the Goodwill in southern New Jersey. They found an old newspaper, a really old newspaper. 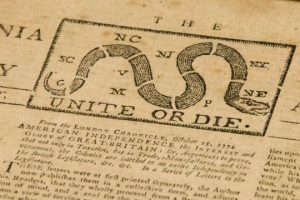 It was framed with the “Unite or Die” snake design at the masthead and the date was December 28th, 1774. No, that is not a typo. This edition for the “Pennsylvania Journal and the Weekly Advertiser” gloats about three items signed by John Hancock who at the time was president of the Provincial Congress. He was pleading for the Colonies to fight back “enemies” trying to defeat them. There are other ads like a reward for a lost horse or runaway apprentice and another states that it will no longer pay his “misbehaving” wife’s debts. Bob Snyder who works for the New York auction house says this ‘rebel’ newspaper reminds us how “everyone was going mad” at the British journal just before the start of the revolutionary war. The newspaper is valued between $6,000 and $16,000 and Goodwill plans to sell it and help fund its educational and job-training services. “It’s only three or four months until the first actual shots of the revolution were fired. So by this time, everybody was good and mad,” said Snyder who also said that newspapers of the day were more partisan than today. This journal was published by William and Thomas Bradford, who came from a distinguished local family of booksellers and printers. “They obviously had a very strong belief system. They were willing to risk their lives to publish,” he said. “With all the anger and angst they have toward Great Britain, they still sign things ‘God Save the King,’” Snyder said.